The last time I wrote a blog was while I was living in France and exploring Europe and its climbing. Since then I haven’t been very inspired to blog about climbing, due in part, to finishing school, a year of student teaching, relocating, looking for meaningful work and starting a new life. In much transition I grew curious to test the waters of competition climbing again. I most recently competed in the 2016 Open SCS Nationals in Boston. The competition left me with many ideas and questions that I want to put out there and see if we can have a conversation among ourselves, U.S. climbers. The last time I competed in SCS was 2010 as a 17-year-old climbing gym fiend at the Youth World Championships in Scotland. Needless to say, during my six year absence from the competing world there are clear shifts in the comp scene. One. The climbers continue to push the standards and are extremely strong. I am very impressed by the strength in all competing climbers, especially at the most recent SCS Open Nationals. The comp ran smoothly, routes were creative and the community of climbers is ever growing. Everyone including the cheering crowd seemed to enjoy themselves. The oldest female was in her 30’s, me (23) and another girl at 21. The rest of the twenty-five female competitors were teenagers. This was not, however, the first time I have felt as an outlier recently. I have been working at Movement Denver since they opened as a route setter and a coach. I am currently the only female route setter in the history of Movement and it has been an interesting experience. I love it. I do everything the male setters do in our job. I carry the same weight, lift the same ladders, set the same amount of routes. In fact I have helped train a few of them. Why aren’t there more female route setters? Why aren’t there more older women competing? Why, in both of these cases are there more men?? As popular climbing has become, I assure you I know plenty of women 20 and even older, pushing the envelope in climbing. But how many of them can make careers in climbing? How many work in the industry? 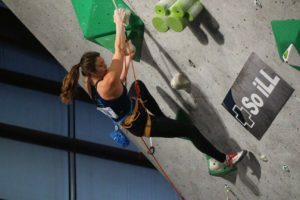 And how big is the purse for the climbers who put in the time for training and endure the cost of traveling to the competitions all around the nation? What are our past winners doing these days? This is not just a gender conversation, or is it? I recognize that a climber needs sponsors to get to travel and climb year round, but many flat out pay for themselves. I have luckily been sponsored by Mad Rock from a young age and receive shoes and gear, but do I need to develop a “personal brand” to get the same credit as the boys? I applaud the youth climbers. They have amazing ability, strength and dedication. I grew up as a youth climber, and now coach these passionate kids. I believe in the program! But is the the comp scene skewed? There is talk that indoor climbing may make it to the Olympics. Is indoor climbing going to go the way of gymnastics and other notable sports where mostly children with parents who can support them in their endeavors get to compete? Are parents supporting a sport where past winners earn their living in the ice capades or circuses in Vegas or as stunt doubles in Hollywood? Back to 2016 and Chris’s question, my answer is they can afford to. They aren’t the dirt bagging climbers out there living on the road, doing the deed, exploring the world for new crags and sending the routes we all dream of. The people that can afford competitions, are either working in the industry somehow or parents who support their youth climbers. I should give a shout-out to my mom at this point :). The climbers who have the ability to train at this level are mostly the youth. All others young adults are climbers who can simultaneously train and financially support themselves who you will find, are majority male. Sometimes, training and supporting oneself means working in the climbing industry through a job that allows that person to continue to think about the nature of climbing, the movement and what it takes to actually climb. Such jobs include coaching and setting. Come on ladies, let’s step up. Come on people (men), let go of your stereotypes, move over and step into 2016. Let’s celebrate, really celebrate all climbers, even the older females, in the amazing community climbing gives us.